Today, I am sharing a quick chutney recipe that you can accompany with a lot of dishes. 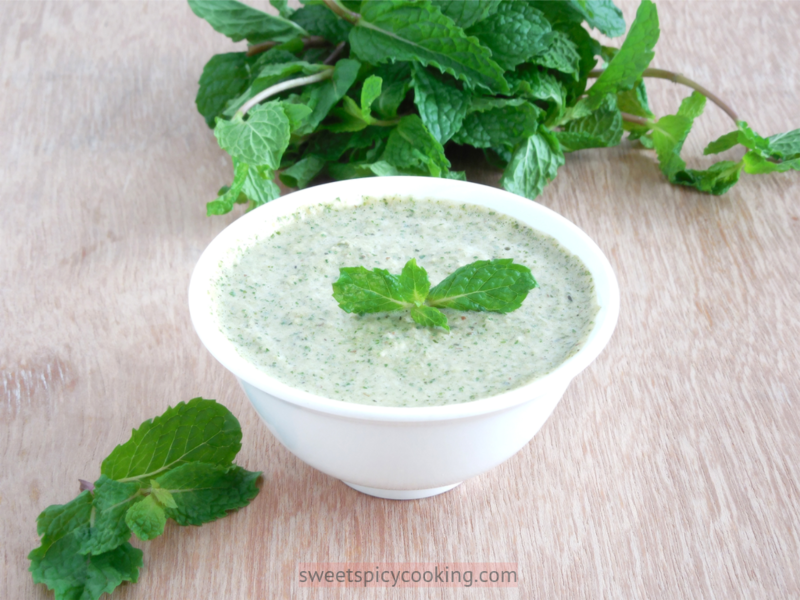 Mint cilantro chutney is very refreshing and makes a delicious dipping sauce for many recipes. You can serve this chutney alongside rice, seekh kababs, and chicken dishes etc. The main ingredients that I use to make this chutney are fresh cilantro and fresh mint leaves. If you don’t like the taste of cilantro, you can substitute it in place of another cup of mint. So you will end up making a complete mint chutney instead. Both are equally good. But in our family, we tend to put both cilantro and mint. Then, you add yogurt at the end to have a cool contrast against the heat of the green chilies. You can add anywhere from 1/2 cup to 1 cup of plain yogurt (as listed in the ingredients above). This chutney is quick to make using a blender. Also, you can easily double or triple this chutney if you want to make a larger amount. Simply double the ingredients and adjust the salt level to your preference. Enjoy! Take a blender and add in the mint, cilantro, green chilies, and 1/2 cup of yogurt. Turn on the blender and blend all of the ingredients together. The mixture should be thick. TIP: If you are having some trouble blending the chutney, add a tablespoon more of the yogurt. Pour the chutney into a bowl and add salt according to your taste. Add in the additional 1/2 cup of yogurt if you find the chutney too spicy or you want a thicker chutney. Serve with a garnish of a few mint leaves or cilantro leaves. Storage: You can store the chutney in the refrigerator for up to 1 week.